Greetings! And welcome to the True North Guitars website -- I invite you to spend some time here to get to know my work better. Please feel free to contact me should you have any questions or if you would like to discuss a possible instrument. 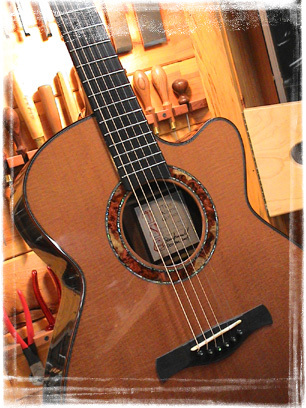 You can reach me by email at dennis@truenorthguitars.com or by phone at 802-244-6488. 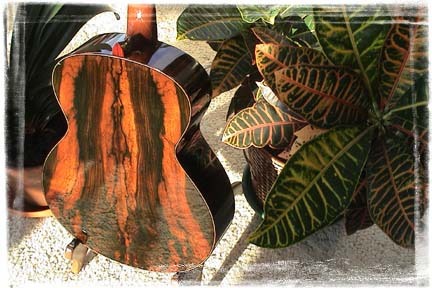 I am an MIT graduate and master woodworker who has played and worked on guitars since the early 1970s. In 1994 I established my lutherie business, focusing on high quality steel-string guitars for fingerstyle players favoring altered tunings. My work has now evolved to encompass all styles of playing, both flatpick and fingerstyle, in standard and open tunings. I have been a member of the Association of String Instrument Artisans (ASIA) since 1994 and the Guild of American Luthiers (GAL) since 1995, the same year I studied under Charles Fox at the American School of Lutherie. Since then I attended numerous ASIA Symposia and GAL Conventions, refined my technique through master classes and further study of individual aspects of guitar making, developed my inventory of master quality tonewoods and materials, completed my guitar studio in northern Vermont, and made guitar making my full time profession. I am totally committed to building the most advanced instrument possible. I love what I do, and I would be honored to work closely with you to design and build your dream instrument. My journey into guitar making began when I bought my first book on the subject back in 1971. At the same time I started a career in high end woodworking, which included sophisticated custom cabinetry which flowed around walls, freestanding spiral staircases, artist studios, creative store spaces, etc. During my woodworking career I created many happy customers and developed a reputation among other woodworkers as "the man with the Angstrom-unit tape measure". In addition to my custom cabinetry and design work, for several years I ran a crew of talented finish carpenters for a custom design/build company specializing in unique high end passive solar homes with unusually complex details. In addition to my woodworking experience, I also have over fifteen years of experience as a product engineer and product manager for a semiconductor equipment company (where my products DID actually operate with submicron precision) and in both product management and program management for a renewable energy company. I introduced my True North Guitars at the 1999 Healdsburg Guitar Festival and displayed at the 2003 Healdsburg Festival as well as the 2000 and 2001 ASIA Symposia in Nashville. My work is featured in Custom Guitars: A Complete Guide to Contemporary Handcrafted Guitars, published in the fall of 2000 by the String Letter Press. My instruments feature graceful, elegant, mathematically pure lines with a unified design sensibility exhibited throughout. Typical appointments and options of True North guitars include ergonomic side-tapered bodies, contoured Venetian cutaways, hand-voiced radiused soundboards with scalloped braces and sculpted x-brace joints, fast graphite-reinforced necks, bound fingerboards with semi-hemispherical frets, extended scales, asymmetrical headstocks, and Green Heart abalone trim. True North guitars present a well-balanced, crystal-clear articulate voice with an open airy bass, pristine highs, and smooth expressive midrange, and are meant to be played and loved for a lifetime. Thanks for stopping by. I truly appreciate your interest in my work. ©1999-2017 True North Guitars. All rights reserved.